As we've already seen, the summer of 1964 is when certain things started to fall into place for Marvel. "Filler" stories were on their way out, the Hulk had been announced as sharing a book with Giant-Man ... and as declared in the Special Announcements page below (from Fantastic Four #31), Captain America will soon be joining Iron Man in a similar capacity. And just look at how many heroes are now guest-starring in each other's books! 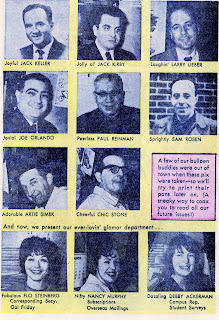 Once again, these scans come to us thanks to Barry Pearl, author of The Essential Marvel Age Reference Project. 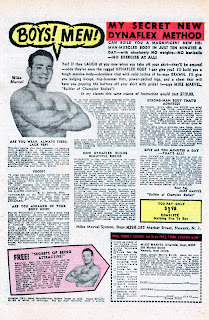 And as an extra treat this month, Barry's also included an ad that ran in that selfsame comic, appearing right after the letters page. Take a gander at this fascinating artifact from the past! By June of 1964, it had been nearly three years since the advent of The Fantastic Four #1, and all the many changes wrought in its wake. New titles were still being added, with Daredevil on only its third issue, and yet Stan Lee knew that there were new readers encountering Marvel's entire stable of superheroes for the very first time each and every month, and perhaps wondering from where this dazzling array of heroes had sprung. To fulfill that need - and perhaps give readers an attractive sampler pack of Marvel's varied offerings, for the price of one shiny quarter - Stan assembled the very first issue of the reprint title Marvel Tales, which would end up running in one form or another until 1994. 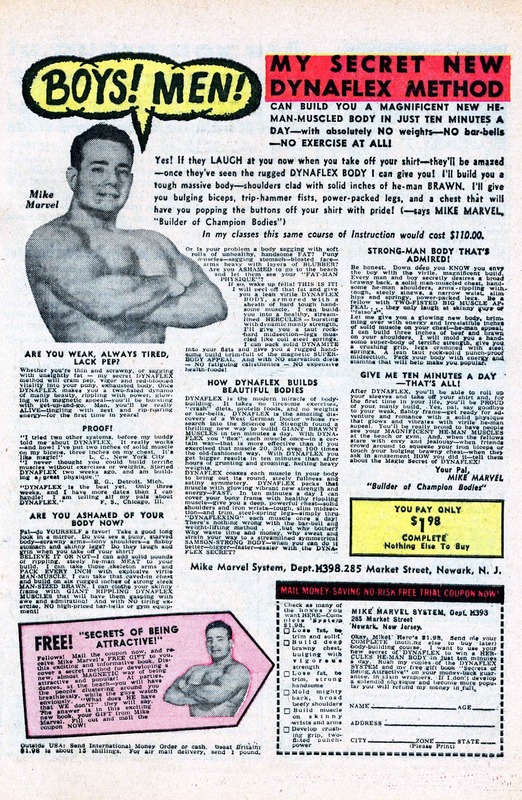 Although this comic was almost entirely a reprint title, there was one new feature included which must have tickled readers, and which has probably given the comic a bit more historical cachet than it otherwise might have retained. 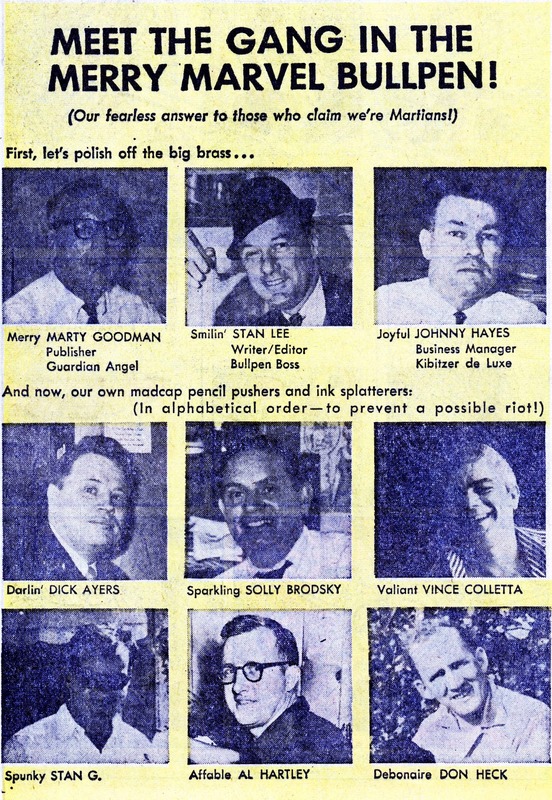 Sandwiched neatly between the Sgt Fury and Iron Man segments are two pages entitled "Meet the Gang in the Merry Marvel Bullpen! ", and displaying photos of many of the Marvel staffers of the time. 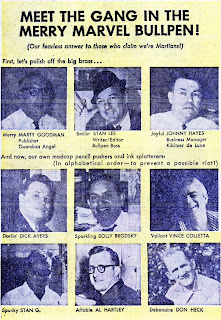 Of particular note is the inclusion of publisher Martin Goodman, and the omission of Steve Ditko! 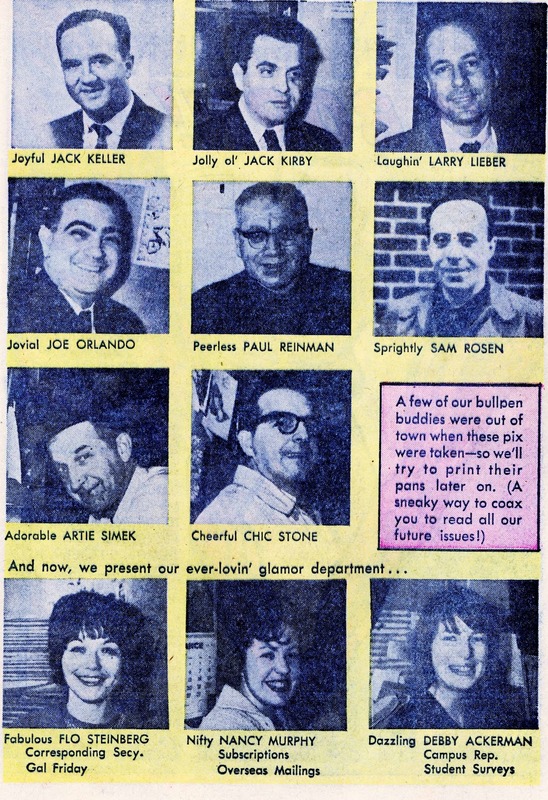 Stan's note on the second page playfully refers to several staffers having been "out of town" - but given Ditko's legendarily reclusive status, one can't help but wonder if he simply refused the offer. And that's the first Marvel Tales Annual! Note that out of all stories contained, the only reprint of a team book is that from the Howling Commandos; the X-Men and Avengers would have to wait till the next year. By contrast, the FF's origin wouldn't be featured in these pages at all - but in fairness, it had already been reprinted as one of the backup features in the first Fantastic Four Annual, just one year before. 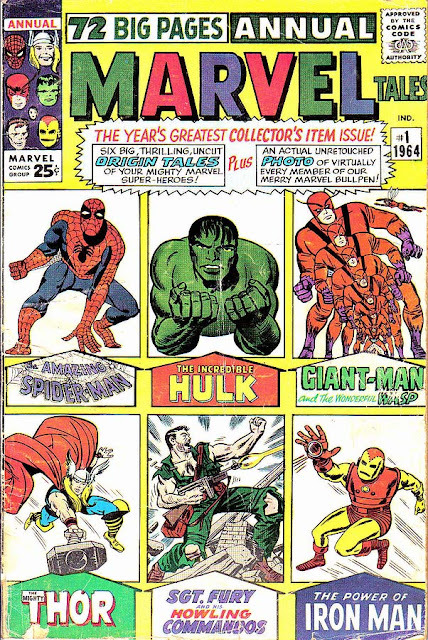 Of course, if you want more musings on the early Marvel annuals, I'd like to direct you to a couple of recent blog posts by Nick Caputo and Barry Pearl. By the purest coincidence we realized that all three of us were writing on the same subject at the same time: Seemingly now, just as then, it's the Summer of Marvel Annuals! Thanks to Barry Pearl for the scan!